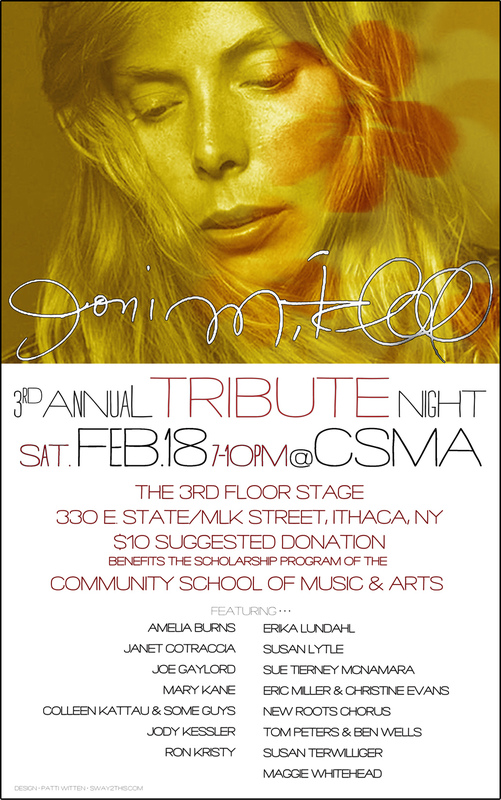 Once again I have had the pleasure and privilege of designing a poster for the annual Joni Mitchell Tribute Concert, a benefit for the Community School of Music and Arts (CSMA) scholarship program, in Ithaca NY. As a Joni fan, songwriter and musician myself, this is a distinct pleasure. Thanks to CSMA Board member Joe Gaylord, who works tirelessly to organize and promote the event. He is also a songwriter, musician and good friend. This entry was posted in design, Music, Posters and tagged design, Joni Mitchell, jonimitchell.com, Poster Design, Posters, singer-songwriter, tribute concert. Bookmark the permalink. The poster is so beautiful and the New Roots Charter School Chorus is excited about participating. Is it too late to alter the poster to include our full name? Thanks for the kind words … I am very sorry but the deadline has passed 😦 I guess there was a communication problem; I was told “New Roots Chorus.” I’m sorry about that. Hopefully that will not affect your enthusiasm! It’s going to be a wonderful show. Thanks for participating.